First off, a huge thank you to all the members of this board. Without your help and guidance, this would not have been possible. I want to put this out there for anyone else who is struggling with a paid charge off from Verizon. Hopefully my experience can help you in some way. To recap, I had an account that was charged off in November of 2010, then paid in full in March 2011. I went the goodwill route first, no love. I then used an EECB and that got me an overnight FedEx letter telling me to leave them alone. At that point I almost gave up, but then I started reading about the Jack Attack. That made me examine the trade lines on all 3 credit reports much closer, and lo and behold, there were multiple errors on each report. So I used the Jack Attack method to dispute them, via CMRRR of course. They all came back verified. I then sent MOV letters to all the CRA's. They all ignored those and just told me again the results were verified, except EX, which refused to investigate further. After having no luck with the CRA's, I sent 623 letters to 2 Verizon addresses that were appearing on my credit reports. 30+5 days later, with no response whatsoever with Verizon, I filed complaints with the AG, FTC, FCC and BBB. Verizon finally responded to the BBB complaint, but their reponse totally ignored my 623. They were responding to the goodwill letter I had sent months before. They told the BBB they were reporting correctly and I would have to just deal with it. So in my rebuttal, I mentioned again the specific items I was disputing on the 623 and told them I had proof they were reporting incorrectly. That got me a call from Executive Customer Service asking for copies of my credit reports. I faxed them just their trade line from 1 report, along with copies of all my green cards for my disputes, and a letter stating that updating the trade line was no longer an acceptable solution since they had ignored my 623 letters and the only resolution I would acccept was a complete deletion of the trade line from all 3 reports. This morning I checked my reports and the trade line is gone. If anyone on the West Coast is having similar problems, PM me and I'll send you the contact info of the person I worked with on this. Newbies, listen to the experts on this board. Do nothing on the phone and send everything CMRRR. Without that papertrail, I would have been up a creek. I've got a Verizon CO from about 5 years ago. It's not paid. I've spent alot of time on this board and elsewhere trying to figure out how to go about this one. It's about $1,200 - and I'd even be willing to PFD. So, Sharkfin, with your experience with them, how would you go about it if you had to do it all over again (as in: before you paid the chargeoff) ??? I would sincerely appreciate your input... and I would like that name and address... would you please PM me (I'm not sure if I'm able to send PMs yet with my account here). I can't tell you how badly I want to send another blast e-mail to all the executives that blew me off, but I won't. I already won, and that's good enough for me. But I really want to rub it in their faces. That FedEx letter made it personal to me. Congrats! Don't send any emails to execs, just enjoy it! It will help make your weekend all that much more special. Funny thing is, I am already a customer. I reapplied for service back in March when I paid off the charge off. I guess the right hand doesn't know what the left hand is doing. Anyway, it can be done. Keep up the good fight everyone! Ha! More like the big head doesn't know what the little head is doing. Screwing half the people in America. I'm GOING to give something like this a shot. I have GOT to bone up (pun intended) on 623s. I'm working FCRA 623 with an old charge-off myself. They completely ignored the first letter. The second letter sent just after the 30+5. I now wonder if I should have went ahead and copied the feds, etc. on this last letter (as I planned to do on my third if necessary), but if ignored again, I certainly will. Guess I will have a nice paper trail established if nothing else. 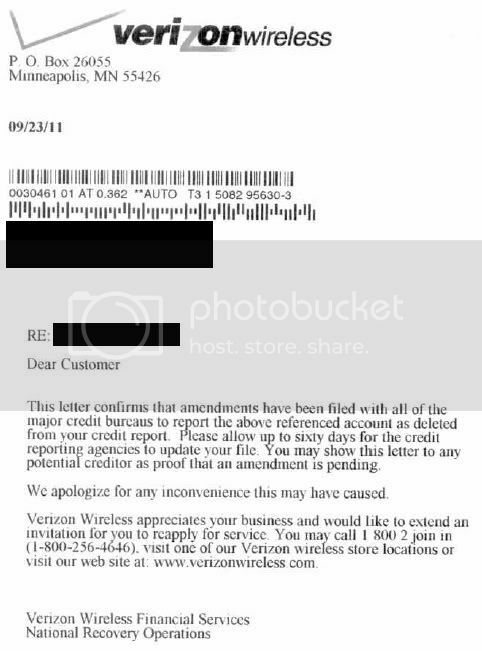 Thanks for all the information as I'm in the beginning process of trying to get Verizon off my credit reports. Would you mind sending me the contact information for who you dealt with at Verizon? I also had a question in terms of Verizon not responding to your 623 letter within 30 days...isn't that a violation in itself or maybe I misinterpreted what the law is on that. Was this persons contact provided through directly by the BBB or did you have to rebuttal through the BBB and eventually someone from Verizon called you? Nicely done. Your hard work finally paid off in the end. Thanks for all the information as I'm in the beginning process of trying to get Verizon off my credit reports as well Sharkfin. Would you mind sending me the contact information for who you dealt with at Verizon? Currently working with the Exec office, i sent email to CEO on Nov 14, received a call on Nov 17, that's the last communication i received. Per that conversation she was going to recommend the account be deleted. I was super excited. She was supposed to call back within in a hour after that phone call but didn't and haven't since. I've left two messages just this week. I just need to know what the status is...so i can make my next move! Ugh! I had a Verizon reporting for a long time and it is up there as a tough one to remove. Persistence. They got tired of me houding them, and deleted. They gave in finally! so what was your method of attack? how often did you send emails? or did you only use snail mail? Wow verizon is a tough one. Sharkfin25, i need to know more! Having almost the exact same problem! How to i PM you? And i dont use this site, can i PM you my email? You cannot send a PM until you reach member status. A few more posts and you will be there.